Thursday, May 17, 2012 • 7 p.m.
Water is essential for civilization and to life on Earth. New oceanic data show that the planetary water cycle is changing faster than anticipated and in surprising ways. In the near future, some parts of Earth are likely to experience intensified drought while other regions can expect more frequent flooding. 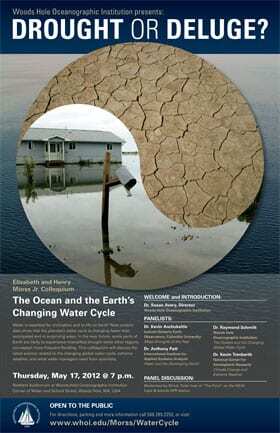 This colloquium will discuss the latest science related to the changing global water cycle, extreme weather, and what water managers need from scientists. Moderated by Mindy Todd, host of “The Point” on the WCAI Cape & Islands NPR station. Learn more about the water cycle and the importance of water on (and in) Earth.